‘The design takes from the city and gives back to the city; It directs, but is nevertheless subservient and puts people and the magic and power of the House at the centre of the place. It creates an unexpected dynamic both externally and internally to the benefit of lovers of opera and ballet, the city of Oslo and the international community.’ That’s was the jury’s characterisation when Snøhetta won the design competition after Norway’s National Assembly (Stortinget) in 1999 approved the building. Groundwork began in 2003 and the opening was on April 12 2008. Here you might spot the swan has gone into the water. 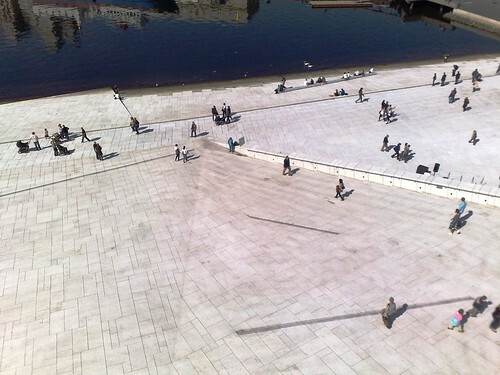 Others than Norwegians seam to like this special construction too: For 2008: Mies van der Rohe Award went to Snøhetta’s Oslo Opera House! It is indeed a very beautiful structure and the grounds are impeccable. Excellent. This is quite a beautiful building and very innovative. I would like to see the performance space. Have you attended a performance there? Are the acoustics good? Sometimes concert halls have to be “tuned” for optimal acoustics. Nice post, thanks. What an amazing building and so interactive, too. Thanks for that insight into one of the architectural delights of Oslo, Renny. Very nice photos again from you. 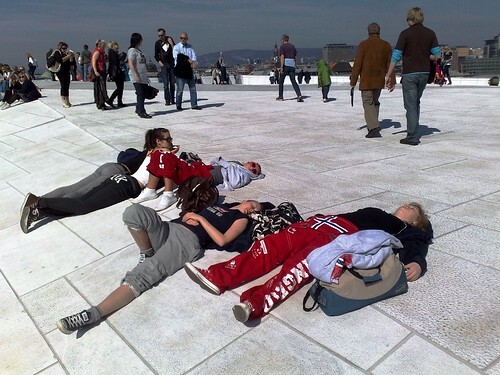 I think that the Oslo opera house more than the Sydney one encourages people to take photos of things happening or make studies of people visiting it, not just architectural photos. Thank you so much, Renny. wow what a beautiful building …..and everyone look so relaxed. Must be fun. If I ever make it to Oslo, we are so going there! What a terrific building. Can you go back and take pics of it when it’s covered in snow, and when it is covered in snow, do kids sled down it? You could of course ski or sled on the building in the winter time, but a bit dangerous to play for kids as its quite staple and the marble stones is rock hard. 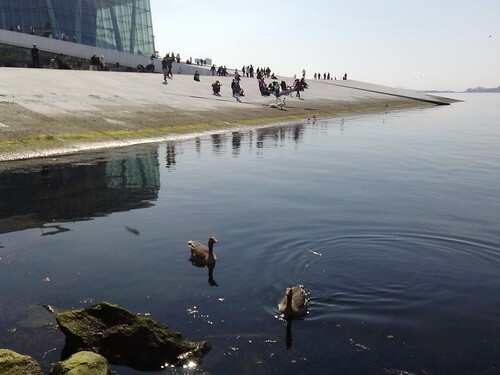 Hi Renny, it seems to me there is another landmark in Oslo! Great architecture and landscaping. 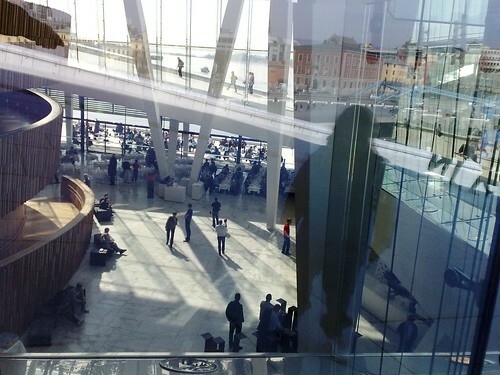 I’m in the construction industry and personnally I found both architecture and structural design of the new opera building are just marvellous! Can’t imagine how the builder put all imagination into reality. By the way, stunning photos taken with just a N82! I remember reading your post about the opera House when it opened last year! I remember having loved it – I even spoke of to my family and friends. Now, a year later…it still looks gorgeous! The view from the roof is splendid! It seems like there are no stairs at all…divine! 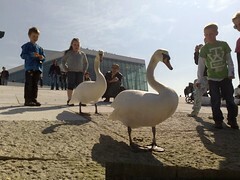 The swans were so cute (I love swans for they are delicate and lovely). The Travelling Bra was there as well? Yes! 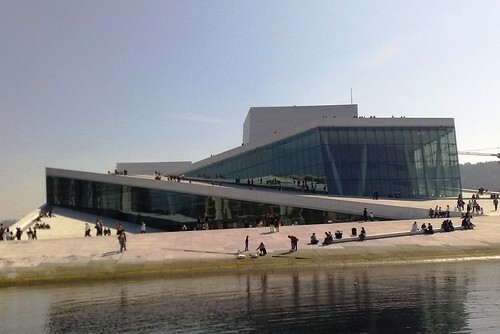 Sounds I know very well now Oslo Opera since I already read your adventures here with Olga and david G.
I hope one day I’ll visit it because the feeling inside with the reflect of the light must be marvelous! Oh, I want try a lazy sunshine sleep at that playground too! That looks like such a fun place to hang out on during a sunny day! Today I noticed the beautiful tulips everywhere making the city so pretty. I need a new camera phone! Beautiful architecture! Will pay it a visit once I am in Oslo. Speaking of which, I am flying back home at the end of May. Even I have posted a photo of it. Fantastic architecture…no wonder it won a price. It looks like summertime already with all those sun worshipers! Oh my goodness, I love that huge roof and the wonderful playground. 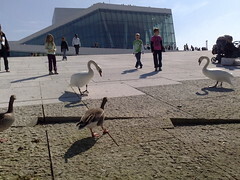 one amazing architectural work..lots of people gathering there..must be one famous focal point in oslo..even goose hanging out there! What a unique and magnificent structure! I would ove to walk on the sloping roof too! That is a very impressive structure. I’d love to go there someday. it looks like the opera in Sidney! Does culture really make people different, or is it mostly aesthetic? (ie. the food we eat, the music we listen to, the art we enjoy, etc.) When it comes down to things like emotions, thought processes, and intelligence levels, are all people really very similar? Hi Piter, how nice to see you and thanks for you’re compliment! PS: You’re English is fine!